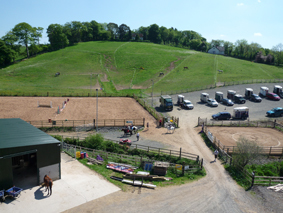 Mill Yard Equestrian Centre is a small family run livery yard situated just outside Anahilt near Hillsborough. Lucy Kerr-McGuinness, along with the help of her family, offer a range of facilities. From custom livery packages and facilities hire, to running jumping, dressage and cross country events. The yard, which is a BHS Approved Livery Yard, is in a quiet rural area with plenty of good hacking but has the advantage of being only a 20min drive from Belfast making it easily accessible. Welcome to ‘Mill Yard Equestrian Centre’ we are a small family run livery yard situated just outside Anahilt near Hillsborough.